Violence over the disputed presidential race in 2007/2008 left an estimated 1,200 people dead, hundreds of thousands displaced, and four prominent Kenyan leaders facing trial at the International Criminal Court (ICC) on charges of crimes against humanity. Despite those charges, two of the men indicted by the ICC are now running on a joint ticket for president and deputy president. Presidential candidate Uhuru Kenyatta is the son of Kenya’s first president and one the richest men in the country; his running mate, William Ruto, a former government minister. Five days after ICC judges confirmed charges against them, Uhuru Kenyatta and William Ruto addressed the crowd. 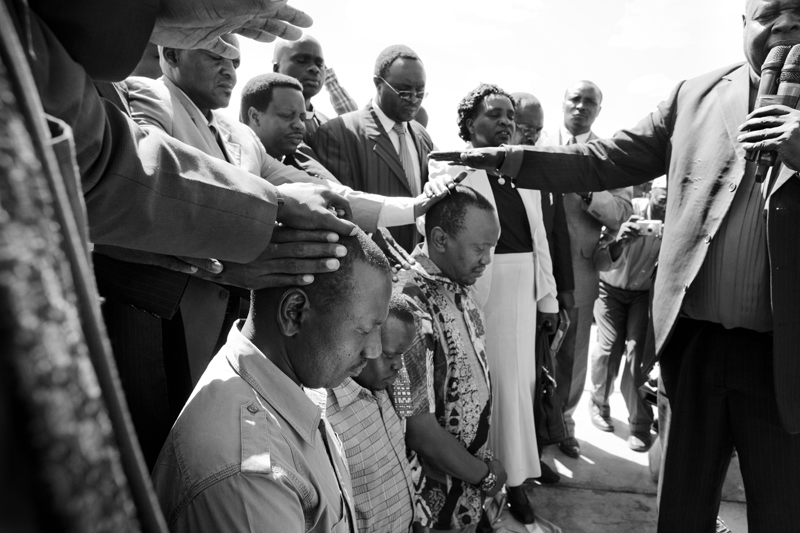 (Left to Right) William Ruto, Joshua Arap Sang and Uhuru Kenyatta, all indicted by the ICC, pray before a "Peace Rally" in Eldoret, Kenya.